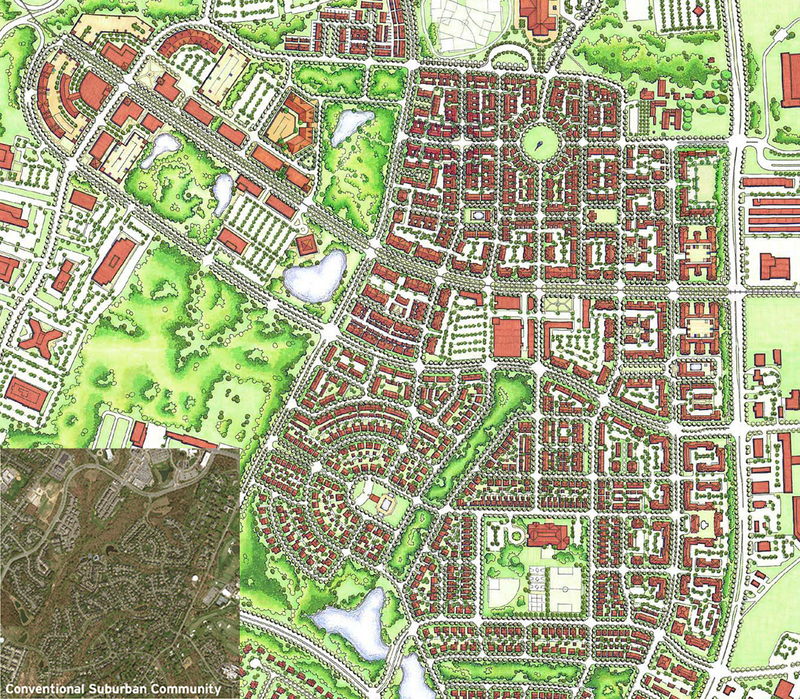 In the face of a national health crisis, designers have the tools to help transform suburban sprawl into healthy, walkable communities where people can thrive. The subject of health seems to be ever present in our lives today. With the influx of data and statistics streaming in from an increasingly connected world, we’re realizing more than ever that where we live, work and play, as well as the quality of those places, can dramatically impact personal and community health. In response, the architecture and planning industry has generated a collaborative and unified focus in designing for Healthy Communities. At Torti Gallas, we are energized by this effort, and are looking to utilize design in every scale of our work to create healthier communities. But what does the term “Healthy Communities” really mean? And how can we improve health through design? The link between health and designing communities is not a new one. In the aftermath of the Industrial Revolution, health officials, social workers, and architects pushed for social, sanitary and housing reforms to alleviate the health crises caused by overcrowded living and working conditions. These reforms and standards created in the beginning of the 20th century established urban planning as a profession and its important role in regulating the built environment for public benefit. That role continued in the post-World War II era, but the emphasis shifted away from regulating dense cities to create healthy living conditions to the single-use zoning and automobile-centric planning that formed the suburbs. Today, rapid advancements in technology have provided public health experts and urban planners the ability to once again collaborate. This time it is through synthesizing voluminous amounts of health data and finding correlations that exhibit how deeply the built environment and urban form affects one’s lifestyle and in turn, physical and mental health. The current national obesity epidemic is a prime example. The CDC reports that the percentage of the US adult population who are considered overweight, a determining factor of heart disease and many other chronic ailments, increased a staggering 60% from 1960 to 2010, coinciding with a period of explosive suburban growth. Furthermore, only 50% of adults in the US get enough physical activity in their lives to reduce and prevent chronic diseases. Definitive research has shown that physical activity is vital to improving health, so environments that promote it – such as active, mixed-use communities that favor walking or bicycling over automobile travel – will improve health conditions. By making connections like these, architects and planners have the ability to advocate for design that promotes healthier lifestyles. Recognizing the need for broader collaboration across the design and public health professions, the Joint Call for Action to Promote Healthy Communities was announced in 2017. It partners the American Institute of Architects, American Planning Association and other environmental design organizations with health based organizations such as the American Public Health Association. This 450,000 member strong constituency endeavors to establish health goals, implement lasting strategies and share their findings. Through our early investigations we have developed the community health report card. It is a comparative tool that measures the health impacts of one community compared to another. Rooted in the development of a set of metrics that have their foundation in medical and planning research, it quantifies the projected differences in rates of chronic disease, hospital admissions, and costs in a neighborhood. Ultimately, the report card illustrates how the elements of design, from the number of street trees to density of intersections and walk score, directly correlate to an individual’s physical and mental health. The work of our firm impacts a wide range of communities all over the country and the world. Its breadth demonstrates that the definition of Healthy Communities is a dynamic one. One neighborhood’s health issues are not another’s. Just as the making of place is not a rubber stamp process, but rather derived from the details and specifics of a locale, our healthy community strategies are tailored to the people and the places they serve. We seek input from health experts and community members to ensure our designs are impactful, always looking to not only eradicate unhealthy determinants, but also to create places where people can grow and thrive.